You may have already seen information on this elsewhere, but if you haven’t, you should go by the new Glenfiddich website, give it a look, and enter the contest. If nothing else, it’s a really lovely site to poke around on for a while. We here at the Malt Impostor have taken the time to write about just a few company initiatives, and our past posts indicate that we like initiatives with the term “Explorer” in them. Okay, so there was only the one, The Whisky Explorers Club, but still, it’s either quite a coincidence or the marketing on whisky drinkers indicates that we’re all secretly yearning for adventure–and not something merely gut-wrenching like bungee-jumping or anesthesia-free appendectomies, but some sort of pioneering activity instead, one in which we strike out into unexplored territory. However, rather than entertaining the mental image of ourselves and our fellow whisky drinkers as pathetic folk sitting around, wishing they were on horses, blazing trails into the west, or on specially crafted space vessels, poised to boldly go where no one has gone before, we’re assuming it is a wonderfully serendipitous occurrence, and one we must embrace–and thus must help promote this Glenfiddich site as well. 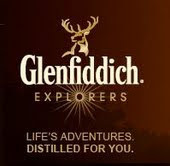 At any rate, the site offers a contest in which visitors can open a virtual barrel and win its contents, with prizes ranging from nothing at all (some barrels are empty, after all) to bottles of whisky to private tastings with Glenfiddich’s Malt Master Brian Kinsman to a £3,000 adventure. There’s also an interactive gallery of some high-end adventures and experiences that Glenfiddich had a panel of experts compile and has commissioned GQ features editor Stephen Hobbs to curate. We here at the Impostor think Mr. Hobbs a far superior choice to philosopher Thomas Hobbes, because few of us actually yearn for a Lord of the Flies-style adventure and because Thomas Hobbes is dead. So go check it out, and if you win something big, let us know: we won’t ask for a share of it (unless it’s a bottle of whisky, perhaps), but we sure as hell want a share of the credit.